Applications to Grinnell College have risen dramatically since 2012, when the number was 3,131, the largest at that time. For 2019, the figure is 7,961, a new application record. “The people here in the enrollment services division have worked diligently and wisely on a variety of strategies to increase our visibility and subsequently our applications,” says Joe Bagnoli, vice president for enrollment and dean of admission and financial aid. 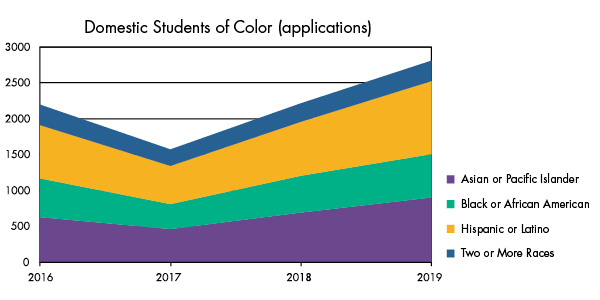 While many factors account for the increase in domestic students of color, one is the increase of applicants from QuestBridge, an organization that helps high-achieving, low-income students apply to colleges. “That’s the single source of greatest increase,” Bagnoli says. Grinnell has partnered with QuestBridge since 2010. Applications are up in virtually all categories of data: domestic students and international students, first-generation students, public schools, and private schools.